Dr. A. W. Chase was a successful Ann Arbor entrepreneur famous for his do-it-all compendium "Dr. Chase's Recipes, or, Information for Everybody." The book contained tips for everyone from grocers to jewelers that included how to detect counterfeit money, preserve eggs, calculate interest, and make ink. The style is authoritative, friendly, and chatty, creating the impression that there is nothing the knowlegable Dr. Chase wants more than to offer you useful tips for daily life. The book also contained medical information, much of it useless, and Dr. Chase manufactured a range of medicines of dubious worth. Here is one. A "cholagogue" is the name for a substance that allegedly removes bile from the system. 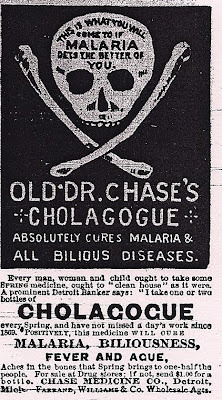 Dr. Chase's Cholagogue promised that it "absolutely cures malaria and all bilious diseases." 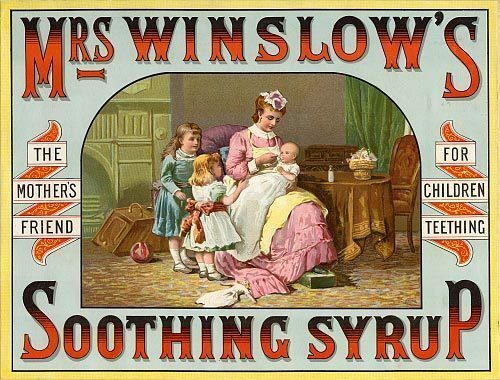 "Every man, woman, and child ought to take some SPRING medicine, ought to "clean house" as it were. 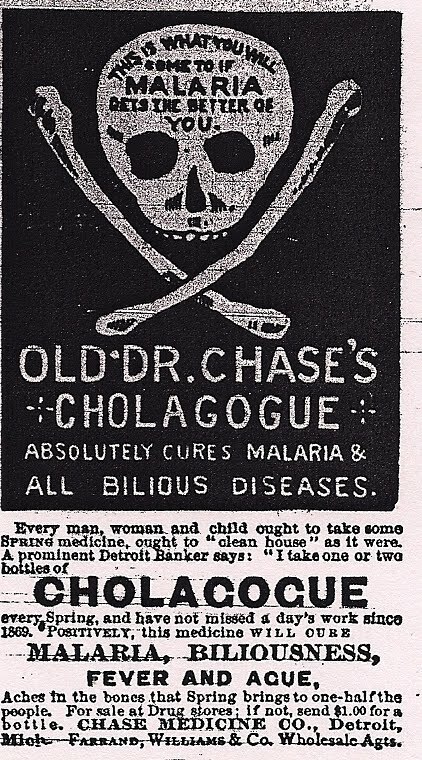 A prominent Detroit banker says 'I take one or two bottles of Cholagogue every spring, and have not missed a day's work since 1869.'" At any rate. Spooky picture, ad saved in "Halloween" file, miraculously remembers to post it, attempts and then deletes forced tie-in between Halloween and the history of patent medicines. So anyways, happy Halloween. The ad appeared in the October 15, 1888 Ypsilanti Commercial. Here is this Saturday's selection from his book "Life on the Farm": a poem that takes as its subject Lambie's apple trees. In the mellow ground, while the robins sung. They showered fragrant bloom o'er my cottage door. I spent happy hours in their shade at noon. Getting ripe "sweet-boughs" off the apple tree. Merry hearts filled barrels of Baldwins full. With feasting and glee and choral song. After yielding fruit for many a day. But they're fading on the grassy lea. When the winter winds blow bleak and cold. I love this letter, from the Ypsilanti Archives. I was tipped off to it by our Archives director G.P. when I scooted down there yesterday. Note how he casually slams his kids and pulls a martyr schtick in the very first few lines. He goes on to discuss crops and the 1856 presidential election. 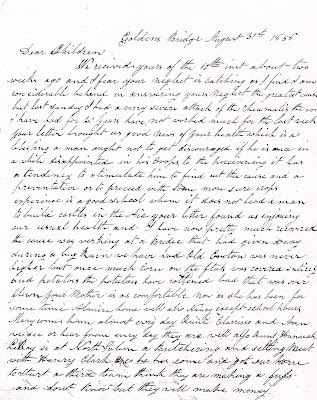 The letter was written from a place called Golden's Bridge near Tecumseh, MI, on August 31, 1856. Like some other letters of this era, it lacks punctuation, so take a breath where needed. Translation: I'm a couple days late with a letter because I was sliding into the grave, but don't you feel guilty about not writing me. It's fine; I'll just die alone, no worries. The last Mystery Spot presented an aerial view from a downtown building...the Masonic Hall, now the Riverside Arts Center. Building Place, Joe, and BF nailed it! Good spottin', gentlemen! This week we're moving to another part of town. 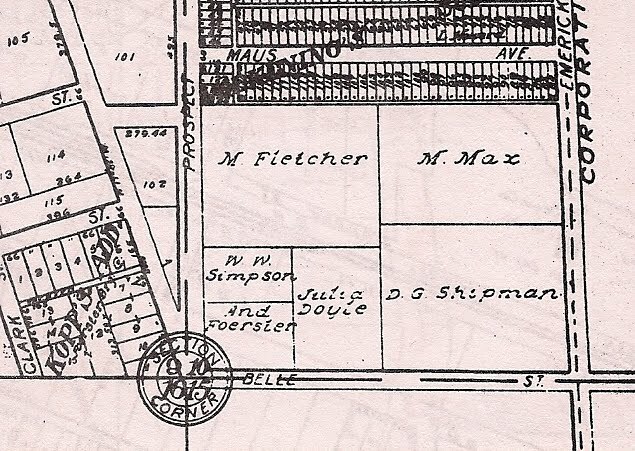 Hmm, what is this regrettably now-vanished building? In past days this was the site of the now-vanished custom of "Flag Day." [hint!] Take your best guess and good luck! Friday Oct. 26th: It has been a rainy day. Richard did not take his violin lesson because he was sick. Sen telephoned from Ann Arbor this afternoon saying he would come down to-morrow and bring one of his room-mates. Prof. Luderer stayed over to-night from the ten o'clock train. I did not see him for he came when I was in bed and went before I got up. Saturday Oct. 27: It rained hard this morning but cleared up this afternoon and was [real] warm. Suv arrived at half past eleven accompanied by his friend and room mate Mr. Moore. This afternoon Eber and Richard took them to ride and see the city. This evening we played six-handed euchre Eber, Suv and I played against Mr. Moore, Richard, and Mama and our side beat. They went home on the 9 o'clock train for their other room mate is going to sing a solo at the Congregational Church and as they wanted to get home to-night. The wind blew quite hard to-night and it is cooler. Sunday Oct. 28: This has been a pleasant day but colder than yesterday. Mama, Grandma and I went to church this morning. They used to have a chorus choir but they have changed and had a quartet. Miss Satsun soprano, Miss Barnard alto, Mr. Pease tenor and Mr. Spaulding bass and we like it much better.Eber Mama and I went to church again this evening. Monday October 29th: It has been a lovely day. Mama, Grandma, and I went to Detroit this morning at 7 o'clock. We went in to shop. Just as we had got through with our dinner and were walking towards the Russel House who should walk up behind us but Uncle Criss Potter and I can tell you we were surprised for we thought he and his family were abroad but he said they had been home a month. He said he had telephoned to Papa saying that he would be out to Ypsi, on the half-past one o'clock train so we parted. We did not come back until the four o'clock train and when we got down to the depot at Detroit who should [we] see but Uncle Cain. It seems he got left on the other train so we all came out together which was very pleasant. Uncle Cain took Jim and Agnes around with him and they met Aunt Nell, Gertrude, and Margaret, and stayed traveling around France, Switzerland, and England for about 3 months and then all came home together. He said they were all sick both going and coming. Uncle Cain said when he went over it was so foggy that you could not see from one end of the boat to the other and they blew the fog-horn every minute and he said all the family were very glad to get back home. We also met Mr. Mervin on the street and he said he was coming out to Ypsi in a few days. Uncle Cain went home on the 9:30 train. Eber went over to the first lecture in the Normal Lecture Course we all have tickets for the whole course but Eber was the only one that went. Mr. [blank space] lectured on the Arctic Regions and Eber enjoyed it very much. Tuesday Oct. 30th: This morning Miss Morton came to do some sewing for us. Papa received a telegram from Uncle Cain wanting him to come over to Chicago so Papa went to-night on the half past nine o'clock train. I went over to our musical club this afternoon and we had a very nice time. Mr. Panne [?] brought 15 copies of a trio and made it a present to the club and we practiced on it and it went very nicely. I took my violin lesson this morning. There was a man from an Ann Arbor green-house around to-day selling Chrysanthemums and they were the prettiest ones I have seen and mama bought 5 of them and they are lovely. Wensday Oct. 31st: To-day has been warm and pleasant. Mama and Grandma went down town this afternoon and I was down to Grandpa's [walking?] arrived and Mr. and Mrs. Bloon drove in and so I entertained Mrs. Bloon until grandma came back. We walked all around the two places and did not go in the house for it was so warm that we thought it pleasant out doors. Mama went to the wedding reception of Miss Kate Glover to Mr. S. Soring Brooke. They were married at seven o'clock and the reception was from eight to ten after which they started for Boston which is to be their home. There were a great many people at the reception and she had a great many beautiful and valuable gifts. Her father made her a present of a $6,000 check [$141,444 today]. We had a rain shower about half past seven this evening. Thursday Nov. 1st, 1888: This had been a lovely warm day just like Spring. Grandma and I walked down to church this morning but we made a mistake in the hour and so church was over when we got there so we turned around and came back.We had a very slight sun shower about noon and that is the sign that it will rain tomorrow. Here's my first attempt at a local history video. This is something I've been wanting to do for a long time. It's pretty rough--I see many areas for improvement (and many built-in limitations, since I'm doing this at home as a non-pro). 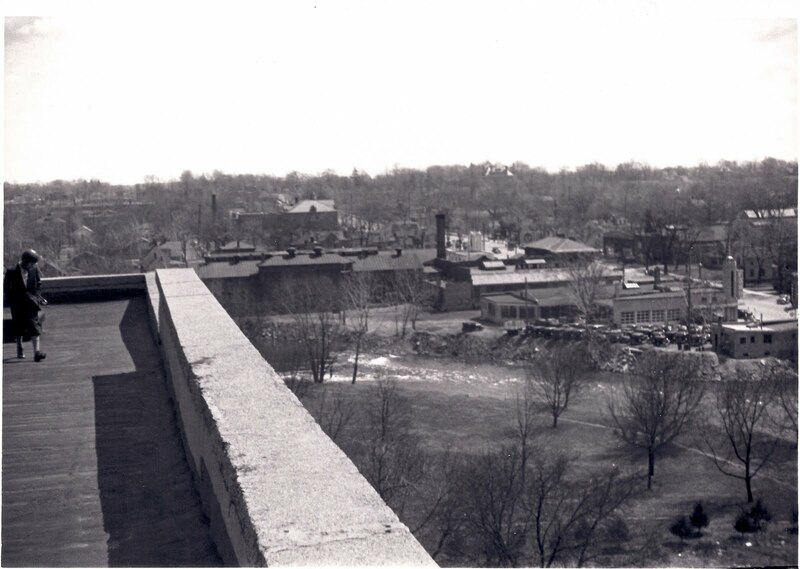 But I think it has great potential as a way to impart Ypsi history. Grateful for our daily bread. When they play a bonnie tune. To the sunny days of old. Like the glee of life's young day. To sing our old hearts young. And joy hangs around our home. 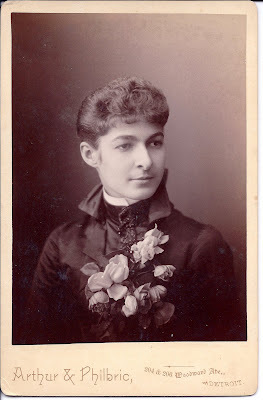 In 1912, a onetime contemporary of Ypsilanti teen diarist Allie McCullough was rising in power and influence. 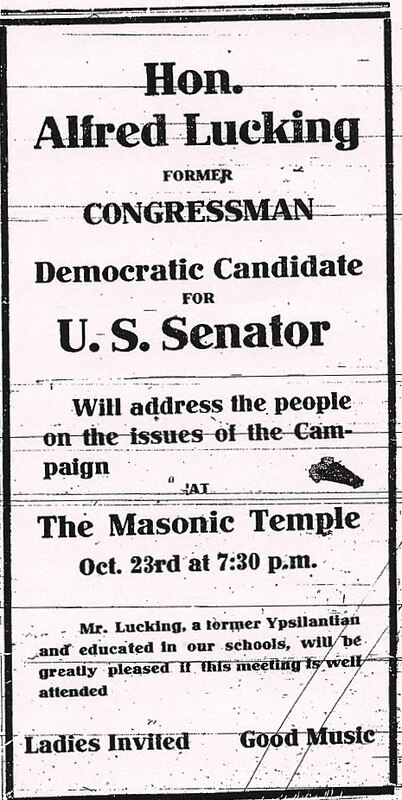 Having served as a congressman, 56-year-old Lucking was campaigning for senator. He would not win this election, but two years later became legal counsel for the Ford Motor Company, a job he held until 1923, six years before his death. Lucking is buried in Detroit's Woodlawn Cemetery at Woodward and 8 Mile...far from the resting place of his onetime friend from so many years ago. June 4 Thurs. Stayed this noon in the Library and Alfred Lucking and J. S. was there too and we had a splendid time. Never want a better time. Have written on my essay. Am afraid that it will not be very good. June 13 Sat. Carrie came down early and stayed to tea. We had a real nice time. When she went home I went up to the school house to practice. Was just opposite Joe's when I met [Alfred] Lucking. He asked my company or rather that he would like to go if I would let him walk with me. Did not get home until about eleven. Had ever so much fun. Friday Oct. 18th: It rained quite a good deal to-day. Richard went down and took his violin lesson this morning. Saturday Oct. 20th: To-day has been pleasant. Mama went out this morning soliciting victuals for Cleary's Banquet which is to be next Tuesday evening. Mama went down to the church this afternoon for the Sunday School meet every Saturday and make things for a missionary box for Christmas. Sunday Oct. 21st: Mama, Grandma, Eber and I went to church this morning and we all like our minister Mr. Woodruff the more we hear him. It has been a pleasant day. Mama, Eber and I went to church in this evening also. Monday Oct. 22nd: This afternoon Mama and I went down to Cleary's Business College to wash the dishes for tomorrow. There were quite a few ladies of the Parish Aid Society there. We washed 500 dishes and did not get home until seven o'clock. It looks rather dubious there this afternoon. The hardware men were there putting up stoves, the painters painting, the gas-men putting in gas-fixtures, Mr. Samson putting a piano in and the masons hurrying to get the foundation in so that they could lay the floor over which they are going to have canvas covering for the college is not finished yet and all to-gether it is in a state of confusion. Tuesday Oct. 23rd: At half-past eight Prof. Cleary accompanied by his faculty and students including a goodly number of young ladies together with many citizens and led by the Ypsi Cornet Band marched to the depot. Upon the arrival of the western train his excellency the Hon. Cyrus G. Luce, Governor of Michigan and the Ann Arbor Light Guard led by the Chequamegon Orchestra of Ann Arbor alighted. The Governor was met by Prof. Cleary and escorted between saluting lines of students and faculty to the carriage, the band playing welcome. The procession then formed and marched to enlivening strains of music up Cross, Huron, and Congress Street to the Hawkins House. Prof. Cleary and Mayor Bogardus rode in the carriage with the governor and other citizens in carriages followed, with the marching column on the sidewalk. Mama and I and a good many of the ladies were working at the College and Prof. Cleary came in accompanied by Gov. Luce and Prof. Cleary introduced him to all of us. 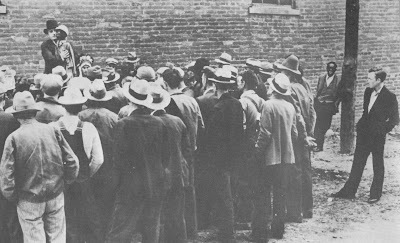 I went down to the depot to take my violin lesson about ten o'clock and when I got through the procession again formed with the addition of the Ypsilanti Light Guards and came down to the depot. Upon the train from Detroit came Hon. Thos. W. Parmer, the senior Senator in Congress, from this State, and Hon. Wm. Livingstone of Detroit late Collector of Customs at that Port, and they were received and escorted as the Governor had been. With two bands and two companies of military, the school and citizens and guests, the procession marched up Cross to Washington when a halt was made and three cheers for the High School and three for the Normal were given. The guests were then conducted to the Hawkins House for rest and dinner. After I saw the parade I went back to the College and stayed until 12 o'clock helping set the tables. Mama, Grandma, and [I] went down again this afternoon. Mama and Grandma did not come home to supper. I came home about three o'clock and went over to the Normal to attend our musical society. I went down to the college about half past six. The students of the College decorated the hall very handsomely. At eight o'clock the guests began to arrive and in a half six hours time the tables were filled and a great many could not sit down. The tables were set for 500. All the young girls of our church helped wait on the tables. Nora Babbitt, Clara Goodspede and myself waited on the table where the Honorables sat. The Honorables were Senator Parmer, Congressman Allen and wife, Mayor Bogardus, Rev. Vissining, Hon. Chas. Whitman, Hon. Wm. Livingstone. We saw the Senator Parmer was eating his ice cream with a fork so Nora took a spoon to him and asked him if he would like it and he said "Oh no, it is all the style to eat ice cream with a fork," and Nora told him she thought not if the room was hot but he went on with his fork. Senator Parmer made a speech on "Business Capacity" and "Business in State and National Affairs." When he got up to make this speech Congressman Allen asked him to stand on a chair but he said he weighed 225 lbs and it would not hold him. Regent Whitman made an excellent address on "The Business College and the Relation between Educational Institutions" Prof. R. W. Putman spoke vigorously on "Character in Business." Captain Allen was given a cordial welcome as he rose to respond to "Success in Business." The Cheguamigan Orchestra played all the fore part of the evening and there was also some singing between the speeches. Wensday Oct. 24th: This morning Grandma, Mama, and I went down to the Business College to help clear up. Mama and I went also down this afternoon. While Mama was waiting there for some of the ladies to come and get their things I took Mrs. Towner over to the fourth-ward school house and brought her daughter Cassie who was not feeling well home. Thursday Oct. 26th: To-day has been very pleasant. Mama was chairman of the entertainment committee and so she had charge of the banquet and she and I went around paying bills for different things that they had at the banquet. After the bills were all paid we shared $280.82. We all think that is doing pretty well. Mama and Grandma went over to Mrs. Cady's to the society this afternoon. Friday Oct. 26th: It has been a rainy day. Richard did not take his violin lesson because he was sick. Sen telephoned from Ann Arbor this afternoon saying he would come down to-morrow and bring one of his room-mates. Prof. Luderer stayed over to-night from the ten o'clock train. 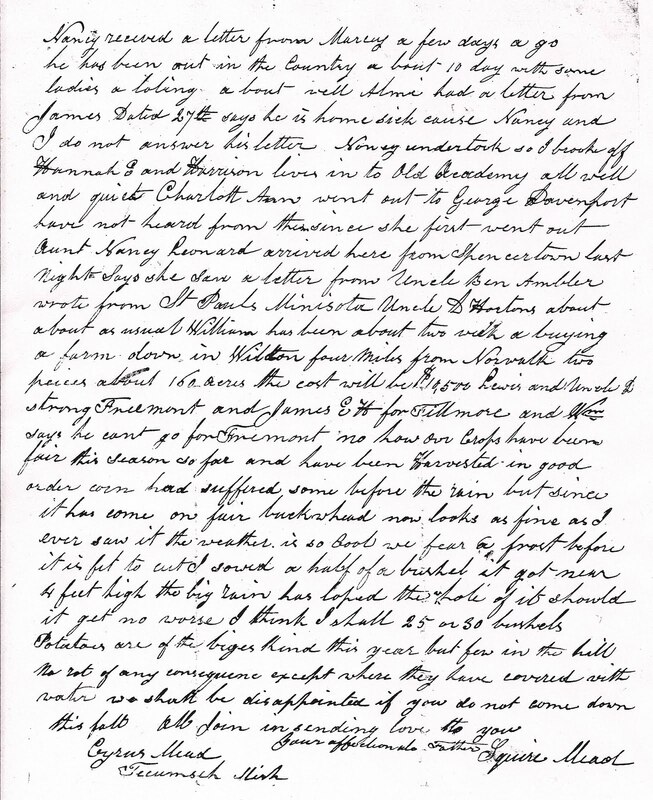 "On stormy days and while resting at noon I have been in the habit of writing the thoughts that passed through my mind while working on the farm. No one complains that farmers write too many books, or make too many speeches, or are in any way burdensome on humanity. They are known by their fruits rather than by their books, and if they fall behind In harmony and eloquence they often more than make it up in common sense and useful industry. The pulpit, the bar, and the press are well represented, but we hear very little from a farmer's standpoint--those who produce the most seem to have the least to say. "When thousands of intelligent people spend so much time and money on books of fiction, no reasonable person can object to a farmer writing a book on what is true, regarding what sustains all classes in this and every other land. In collecting my scattered letters and publishing them, I hope no one will be offended, and some will be entertained and benefited. And if any one does not like my book, I hope they will write a far better one on the same useful subject, and I will not be offended at those whose powers overshadow mine, but rather be glad that I have been the means of 'provoking them to good works.' --W. L."
In other words, take it or leave it. Dusty D likes Lambie's self-confident pro-farmer standpoint. There's even a whiff of superiority--the farmer as the laconic yet useful producer as compared to windier professions. Dusty D likes that too. Without further ado, here is "Lines on Receiving the Picture of Mr. and Mrs. Geddes." Since we found you kind and true. So active at four score. And all the "whisky party." And king of the pioneers. "Isabel Vane, the novel’s aristocratic heroine, is refined and virtuous, but in ‘a moment of passion’ allows herself to be seduced from her husband and children by a worthless lover. Abandoned and tormented with remorse, she is involved in a railway accident and left for dead. She then returns to her former home, unrecognisable because of a scarred mouth, a sorrow-stricken air and blue spectacles, and acts as governess to her own children. Her son dies without knowing who she really is (her expression of understandable agitation, ‘Dead! dead! And never called me mother,’ which remained a popular gag with music-hall comedians well into the 20th century, belongs to a stage version, not the novel). 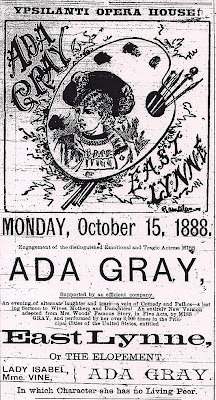 After this cruel blow she falls into a decline, but refrains from revealing herself to her husband until she is at her last gasp: ‘Keep a little corner in your heart for your poor lost Isabel.’"
"You all chaffed me when I gave Ada Gray and he "East Lynne" a good notice to go travelling with, and took the trouble to explain to Manager Watkins how it was that a week of his star would be enough for advertising purposes and too much for the New York public. "Watkins thought that he knew more about it than I did, and so, instead of going away quietly at the end of a week, he lingered near, like Mary's lamb, in the wild hope that ultimately the public would appear. "Of course he insisted that the house was crowded. They all do it. And equally, of course, the Telegram put in paralyzing paragraphs about his big business. They always do it on the Telegram for so many lines of advertising. "Then, in consequence of the crowded houses, the popular enthusiasm, the money turned away, and all that sort of thing, Manager Watkins reduced his prices. That settled the business. Last Saturday the gates of the Fifth Avenue softly shut up, never to reopen upon Ada Gray and "East Lynne" any more. "How much more profitable it would have been to skip away after the first week, before anybody could tell whether the star was a failure or not, instead of braving the losses of the past fortnight and being boosted out of town ignominiously on the eve of Independence Day ? But every country manager thinks that he knows New York. The only managers who frankly confess that they do not know it all are the New Yorkers." Despite that sneer, "East Lynne" was hugely popular in its day and inspired multiple stage and later film adaptations, one as late as 1931. Dusty D wonders why such a seemingly silly story (as if her husband would not recognize her) was such a smash hit. I'll have to ponder that. Tuesday Oct. 16th: This has been a very pleasant day but the wind blew very hard one of the trees in front of the Normal blew down. There was a great accident happened this morning about half past eight at the Peninsular Paper Mill. One of the boilers blew up killing one man and injuring another. It spoilt the boiler next to it sending it into the wall and knocking a hole into it. Papa, Grandpa, Eber and Richard rode up to see it and I ahall go up tomorrow and can write more about it then. Article: "At about 8:15 Tuesday morning, one of the gang of boilers in the Ypsilanti Paper Comany's Lowell mill exploded with terrific force, throwing the other three boilers from their foundation and utterly demolishing the boiler room. "Luckily the direction of greatest force was away from the main buildings, which contain all the manifold machinery used in paper making and in which most of the employees were at the time, else the damage and loss of life must have been much greater. "The only person in the boiler room when the explosion occurred was Jacob Slawson, who was temporarily filling the position of fireman. He was instantly killed, his frightfully disfigured remains being found shortly after the explosion, minus part of one leg, and the back of his head. Frank Sinulki, the engineer, was the only other person injured. He was found unconscious, wedged between a heavy lathe and a pump, and buried under bricks, mortar, and other debris three feet deep. He was recovered after about an hours hard work, and, strange to say, not a bone in his body was broken. Although severe internal injuries were for a time feared, he is now convalescing and will be up again in a week. That he escaped instant death is little short of a miracle. "The 75 horse power boiler which burst parted just back of the crown sheet, and also ripped open lengthwise. It spread out into an immense sheet of iron which flew a distance of some eight rods [one rod is 16.5 feet], across the railroad track, cutting the telegraph wires asunder, and struck a great elm tree in a neighboring field with such force as to wrap itself almost completely around the trunk. The flues were all bent nearly double. The foundation of the immense smoke stack was torn away, so that, though it is still standing, it will probably have to be rebuilt. "The loss we have heard variously estimated. Probably $20,000 would cover the amount, except the damage to business. The Paper Company we understand has $15,000 insurance in the Hartford Steam Boiler Insurance Co. The mill will probably not be in running order again until the middle of December. "The cause of the explosion is unknown, though it is supposed to be low water. Nothing definite will ever be known, however as the only man who could give testimony on the point, is dead." ---October 19, 1888 Ypsilanti Commercial. Have you heard that ongoing series on Michigan Radio called "Three Things"? Reporters ask random people about the three things they could do to improve the sour Michigan economy. There's one way to sweeten it--but not with traitorous cane sugar. Do you see sugarcane fields waving in the wind in Augusta Township? Have you sipped a nice bag of cane juice at the Farmer's Market? Do you drive past machete-wielding workers chopping down stalks? I thought not. Do you know three things you could do to send the Michigan economy skyrocketing? You could buy three bags of "Pure Michigan" beet sugar. Fall is the peak sugar consumption season, with Thanksgiving pies, steamy cocoa, and cup after cup of coffee sending sugar consumption soaring. Do your part this fall season to keep your sugar expenditures in your home state. Know how you spell economic recovery? B-E-E-T-S-U-G-A-R.
Friday Oct. 12th: It has rained pretty nearly all day. Saturday Oct. 13th: It has rained off and on all day and [I] have stayed in the house all day for I have taken a very bad cold. Lew telephoned down from Ann Arbor this morning for the boys to come up and see the football rush but the roads were so bad and it looked as if it would rain any minute and so they did not go. Grandpa came home to-day. Sunday Oct. 14th: Mama and Eber went to church my cold was so bad I could not go. It has been a cloudy day but has not rained much. Monday Oct. 15th: It has rained all day. A week ago last Tuesday Mama sent her violin into Detroit to be fixed and we received it this afternoon and it sounds and looks very much better. Tuesday Oct. 16th: This has been a very pleasant day but the wind blew very hard one of the trees in front of the Normal blew down. There was a great accident happened this morning about half past eight at the Peninsular Paper Mill. One of the boilers blew up killing one man and injuring another. It spoilt the boiler nint [?] to it sending it into the wall and knocking a hole into it. Papa, Grandpa, Eber and Richard rode up to see it and I ahall go up tomorrow and can write more about it then. I took my first violin lesson to-day. Our musical club met this afternoon Mr. Parntes read the Constitution and our club was named the Learic [Lyric?] club. Then we elected for officers Minnie Wilber for Pres. Laura Jeniss for Vice Pres. Lester See Sec. and Grace George for Tres. Mama, Grandma and I called on the Sills. Wensday Oct. 17th: I did not go up to see the wreck for Eber took Mama west into the country to buy some turkeys to have for Cleary's Banquet, so I could not go. But Richard says that the boiler landed across the road and wound around a tree so that you could walk under it just like a tent. Thursday Oct. 18th: Last night Mama went to a Ladies Library social at Mrs. Walton's and Grandpa, Richard and I went to the Opera House to hear a minstrel troupe and it was splendid. After we had been home a little while I think it was about eleven o'clock Richard and Papa started to put the horse out they had not got but half way to the barn and we all heard some one screaming for help and Papa and the boys started and they found a woman in front of the Normal yard on the ground and I never heard such screaming in my life. It seems that she had just come on the train and its being a very bright moonlight night and she thought she would walk up to Mr. Hutton's where she rooms and after she had walked a little way a man began to follow her and he chased her up as far as the Normal and caught her and got her purse and when Papa got over there he had run and the poor woman was so scared that she could not tell where she wanted to go and so Papa took her into Mr. Gallops and they knew her and said she roomed at the rent house where Mr. Hutton lives. She thought it was a colored man but she was so scared that she is not sure that it was. They arrested a colored man to-day but he proved not to be the one. 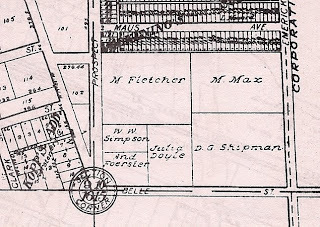 Marsh and Son was a coal company that operated in what is now the Sidetrack's rear parking lot. 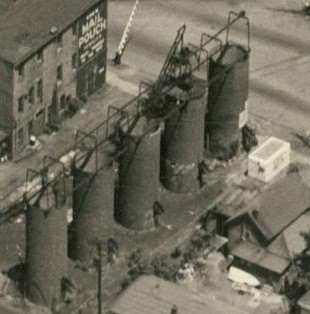 Five huge silos supplied coal to trucks carting it to private homes' coal cellars, or you could pick up your own. To read the recollections of someone whose mom worked in the coal company office and who went out on coal deliveries to outlying farmhouses, look here. 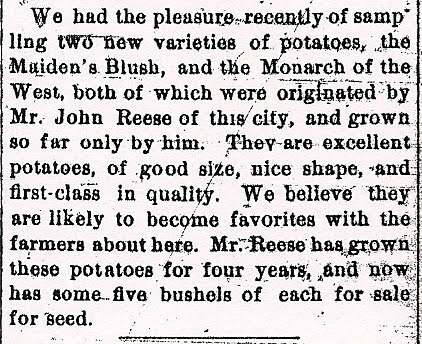 One October day in 1888, 49-year-old Ypsilantian Edward Reese walked from his home towards his backyard potato bed--the special one. It was time to discover if his effort had worked. He reached the bed, poised his potato fork near one withered plant, and sunk it into the ground. Edward pushed down the handle and up came the tines--fat, ripe potatoes rolling off the fork. But were they the kind he'd imagined and bred for, or just another failure? He picked one up and pulled his jackknife from a pocket. He cut off one end. The potato was tinged with pink inside. It had worked. 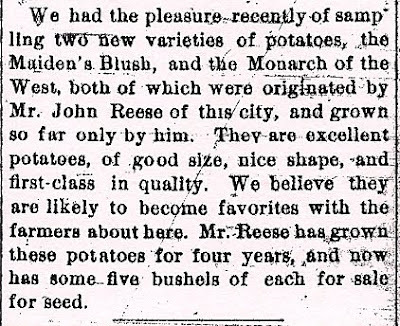 Edward Reese had invented a new potato. Edward took some into town and dropped by the Ypsilanti Commercial's office to show them off. On October 5, the paper printed the above story describing his creation of two new varieties, "Maiden's Blush" and "Monarch of the West." The names sound like those of roses--Edward was proud of his potatoes. The paper misprinted his name as John. Edward may have mentioned a John in the Commercial office and perhaps an editor garbled the names. Edward did not patent his new potatoes. At the time, it was not possible to patent plant material. Nor was Edward selfish or stingy with his invention or afraid of competitors. 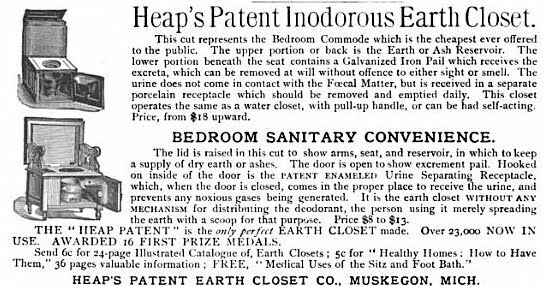 He took out an ad in the October 12, 1888 Ypsilanti Commercial offering both varieties for sale. Edward was not a rich man. 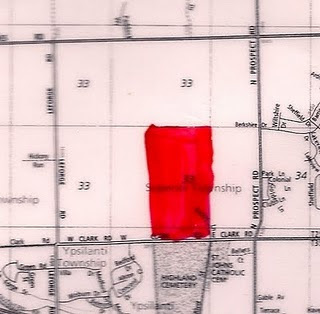 He had a relatively tiny, by Ypsilanti Township standards, farm of only 6 acres. It lay south of Congress Street near Hewitt. Most of his neighbors' farms were worth far more than his. Edward lived there with his 58-year-old wife Elizabeth. Edward and Elizabeth had emigrated from England years ago. They had brought their son John, an only child. Although Edward spent hours of his life in careful ministration to plants, in a cruel twist of irony it was the plant world that killed his son. At age 15, John fell from a tree and died. 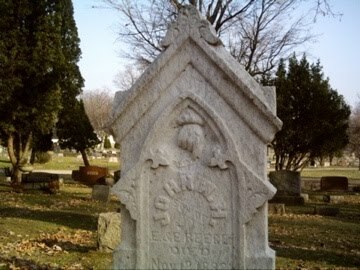 John is buried in Highland Cemetery. His grave is large, elaborate, and expensive. It shows a hand descending from the clouds holding a broken chain, symbolizing the breakage of the family chain. 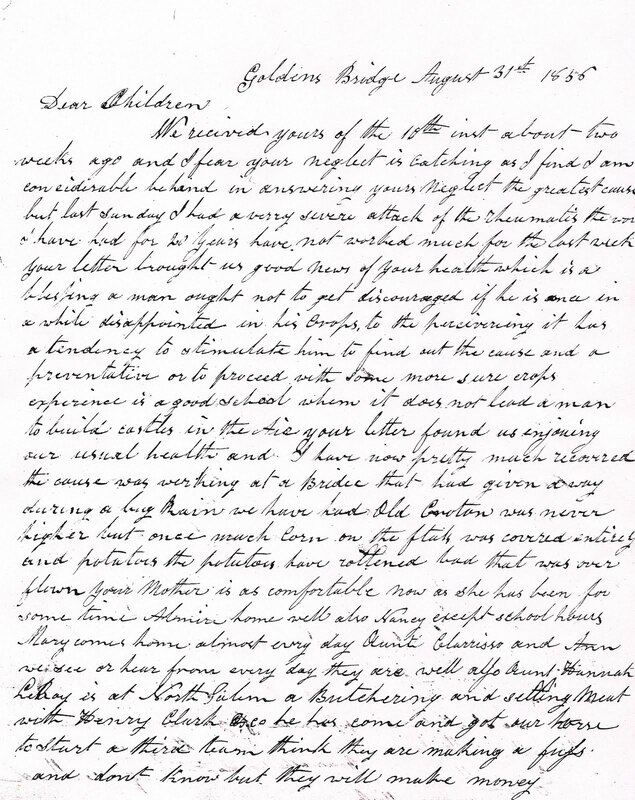 Stately script gives his death date as November 12, 1882. 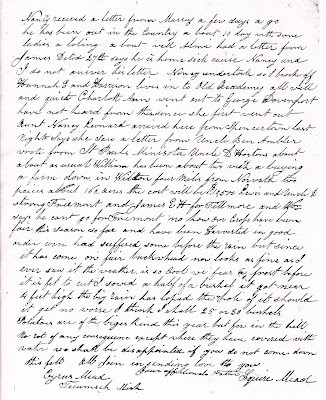 It is likely that Elizabeth wrote down the words about her boy's death to give to the stonecutter: Edward couldn't write. Edward's "Maiden's Blush" and "Monarch of the West" never caught on. They weren't shown at agricultural fairs, won no awards, and are not an available heirloom variety today. The names, unlike those on his son's beautiful tombstone, faded away. 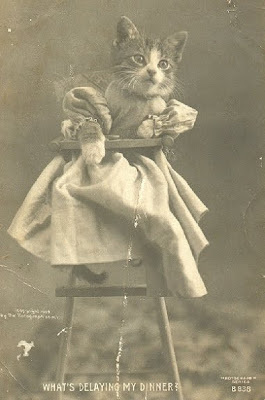 Pennsylvania native Harry Whittier Frees (1879-1953) specialized in lolcats (and lolpuppies, even lolchickens and lolbunnies). He turned his turn of the century photos into kids' books, postcards, and magazine articles, and his work also appeared on calendars. Of his work, Frees once said, "Rabbits are the easiest to photograph in costume, but incapable of taking many "human" parts. Puppies are tractable when rightly understood, but the kitten is the most versatile animal actor, and possesses the greatest variety of appeal. The pig is the most difficult to deal with, but effective on occasion. The best period of young animal models is a short one, being when they are from six to ten weeks of age. An interesting fact is that a kitten's attention is best held through the sense of sight, while that of a puppy is most influenced by sound, and equally readily distracted by it. The native reasoning powers of young animals are, moreover, quite as pronounced as those of the human species, and relatively far surer." Link to more links to more photos. However, Frees was far from the first lolcatter. A generation prior to Frees' work, English photographer Harry Pointer was doing the same. 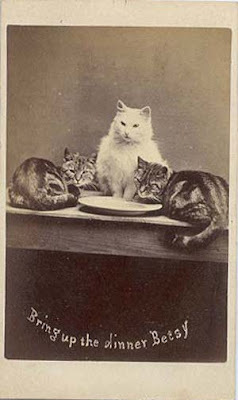 Pointer turned his 1870s cartes-de-visites (small photographs) into little greeting cards by adding captions. His over 200 images are collectively known as the "Brighton Cats." Mini bio and lots more charming images (scroll down) here. Ann Arbor college men hopping on the interurban and cruising down to Ypsilanti to woo the large numbers of female college students at the Normal used to be a time-honored practice. 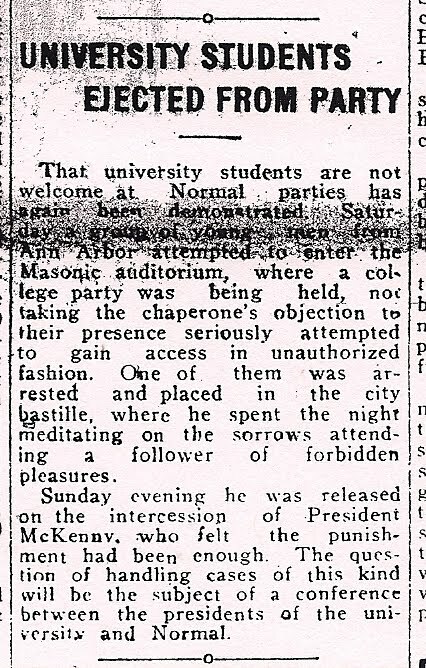 But sometimes it went too far, as it did this night in 1924. The U-M men crashed a party at the present-day Riverside Arts Center, blasting right past the chaperone. It didn't end well. "One of them was arrested and placed in the city bastille where he spent the night meditating on the sorrows attending a follower of forbidden pleasures." The altercation led to a meeting of the presidents of both universities to find out how to stamp out such vexatious nonsense. Dusty D heard from a very kind reader whose grandparents had a Sears kit home in town. As you know these came in on the train as a kit complete with a "keg of nails." You built it yourself. "$2,870: At the above price we will furnish all the material to build this six-room bungalow, consisting of mill work, medicine cabinet, buffet, kitchen cupboard, lumber, lath, shingles, porch ceiling, flooring, finishing, lumber, building paper, eaves trough, down spout, sash weights, hardware, and painting material. No extras, as we guarantee enough material to build this bungalow. Inside floors, trim, doors, etc. furnished in clear red oak for $220 extra. Price does not include cement, brick, or plaster." Medicine cabinet and sash weights included. $2,870 in 1917 would be $47,600 today. 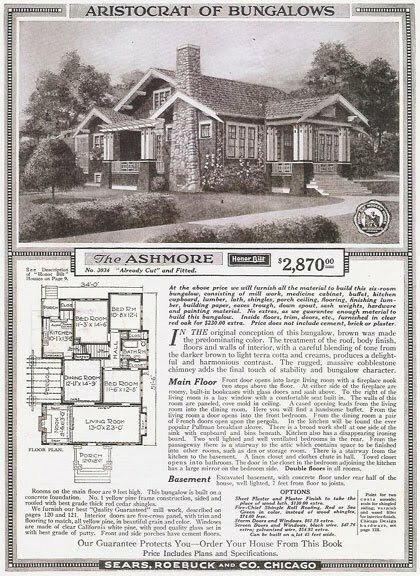 More info on the Ashmore. Now, are there any Sears homes in Ypsi? There was at least one; it seems possible if not likely that there were more. Dusty D is on the case, but would very much appreciate any tips from kind readers--and of course Id be sure to credit you for help in the piece. Let's find those Sears kit homes! 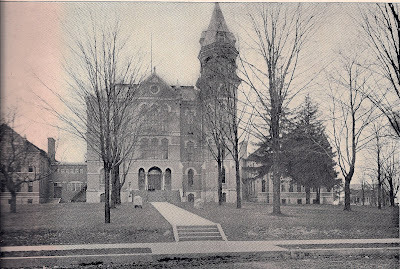 Readers, have you ever found yourself at odd moments "Gee...I wonder what the history of the University of Michigan's onetime failed promotion of inodorous earth closets was all about..."
Try to wrap your mind around this: in 1920, the municipal sewer system drained directly into the Huron River. No water treatment plant. No filter. No sterilization, purification, or de-ickyfication. 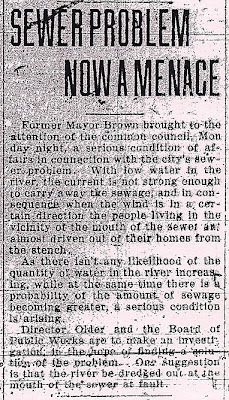 In October of 1920, the water level dropped and the effluent was piling up in the Huron. The aroma wafted over area homes. Delightful when you're sitting down to your home-cooked meal or snuggling into bed. 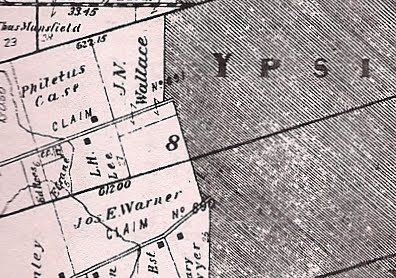 In 1920, the population of Ypsilanti was around 7,500. So that's 7,500 "donations" to the problem every day--more if on a high-fiber diet. Luckily winter was right around the corner. Stay tuned for more entries into the Effluent Chronicles. Friday Oct. 5th: To-day has been cloudy and has rained off and on all day. This evening Mama and I put up some new lace curtains in the red room and they look quite pretty. Eber went to Lyceum this evening at the Union School, of which he is treasurer. We canned a bushel of peaches to-day. Saturday Oct. 6th: It rained all night off and on and to-day has been cloudy. Eber drove up to Ann Arbor this morning to bring down Sen [?] Trowbridge, Mama's cousin, to spend Sunday. He is studying Pharmacy at the University. This afternoon Eber took him for a drive all over Ypsi and he thought the place very pretty. Mama, Grandma, and I went down to Mrs. Hemphill's this afternoon there was a meeting there of the church society for the purpose of deciding whether they should furnish the supper for Mr. Cleary's banquet, which is to be two weeks from next Tuesday. He sends out 700 invitations and the Aid society are to furnish supper for that many for $230.00 and they decided to take it. Mama and I then went over to the church where our Cunilararys [?] held a meeting in the Infant Class room and then Mama staid after that to the teacher meeting at the same place. While Mama was attending the teachers meeting Maggie Gilbert and I drove all around and went to the Ladies' Library and had a nice time. This evening we went down to Grandma's to spend the evening. We played six hands euchre. Mama, Grandma and Richard against Sen, Eber and myself and our side came out victorious afterwards. We had grapes and angel food cake. Sunday Oct. 7th: To-day it has rained pretty nearly all day so we did not go to church. Sen stayed until about four o'clock and then Eber took him back to Ann Arbor. Monday Oct. 8th: This has been a pleasant day and a little cooler than yesterday. Mama and I went down town and had a very nice time. Grandma's girl has gone to Detroit to make a visit so Grandma and Grandpa came up to dinner and supper until they get a girl. Tuesday Oct. 9th: To-day has been real cold. Richard took his violin lesson to-day for I sent my violin into Detroit to be fixed so I could not take my lesson. Laura Jeness came up this afternoon to invite me to attend a singing club at the Normal School at a quarter past four. There are about 30 of the town girls belonging to it and we meet every Tuesday to practice and Mr. Parmer directs. Mama went over to the Conservatory of Music to attend the first meeting [of the] musical committee of the Sappho. Wensday Oct. 10th: To-day has been a beautiful warm day. This morning I wrote a letter to Lou Snyder. I took Maggie Gilbert for a long ride this afternoon and we had a lovely time. We have had a frost last night. Thursday Oct. 11th: Last night our church gave a reception to our new minister Rev. Mr. M. C. Woodruff at the residence of Mrs. Quirk. It went off splendidly and every one was pleased. We had refreshments and Maggie Gilbert and I helped wait on table. Grandpa and Grandma were on the receiving committee with Mr. & Mrs. Quirk, Rev. Mr. & Mrs. Woodruff, Mrs. Graham, and Prof. Gill. To-day has been colder than yesterday. Mr. Yost made Eber a present of a very handsome carriage blanket today. The soldiers have a reunion of the 20th Infantry of Michigan there to-night and this afternoon we saw a good many of them on the street. Grandma received a letter from Aunt Kate last night saying they left St. Paul Minn. on Monday morning and arrived in Tacoma Washington Territory the next Saturday morning. It was the first we had heard of and we were very much surprised. Grandpa went to Plymouth. Aunt Kate says it is lovely there. The thermometer does not go hardly down below freezing all winter. They expect to stay there all winter. I wrote a letter to Lou Snyder. Friday Oct. 12th It has rained pretty nearly all day. 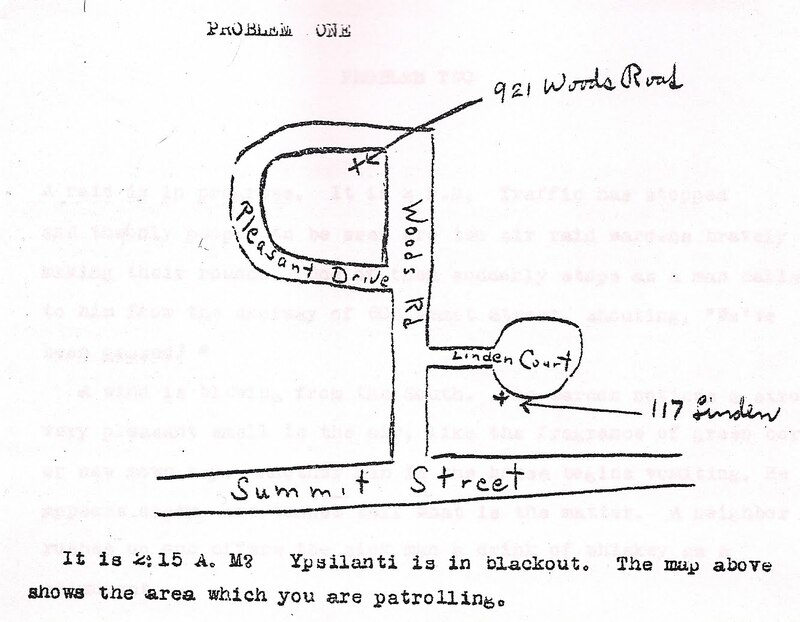 A mysterious tale about a still-unsolved Ypsilanti mystery from the Depression era. 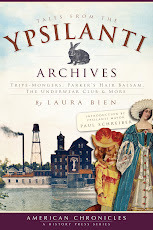 "With Halloween on the horizon, local author Laura Bien spins a tale of a skeleton–four, actually–in Ypsilanti’s past." 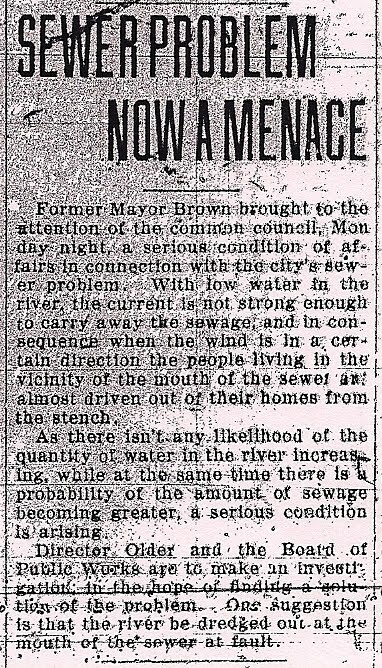 EDIT: Remembering readers' chorus of cries for more stories touching the topic of "effluent," I have added that tag to this tale. ALSO: another effluent-related story is imminent; stay tuned! 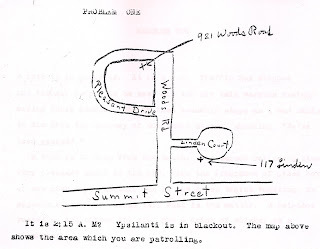 On a Wednesday night in late August of 1932, 20-year-old Ypsilanti day laborer Edward Furlong vanished. By Friday, his disappearance had reached the Ypsilanti Daily Press, which reported that his relatives had last seen him heading towards downtown that night. Police questioning determined that he met up with two men in a cigar store and headed off to see a medicine show on Ecorse Road. The Ecorse show may have been held outdoors under a tent or on a portable stage. 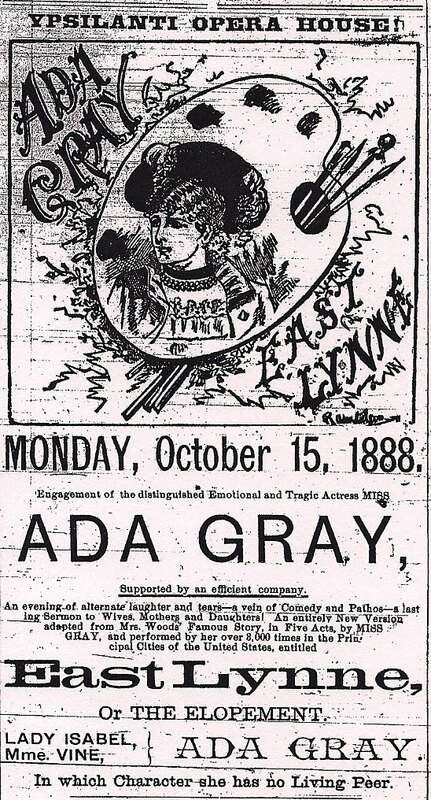 Aside from the pitchman hawking his cure, medicine shows included a variety of performers. According to one website, "[The shows] developed their own unique brand of variety out of a curious mixture of vaudeville, burlesque, dime museum material, and the minstrel show. "Blackface Singing, Dancing Comedians; must play banjo and guitar. Lady Performer; must sing and dance. Lady to handle and take care of snakes. One good Sketch Team. All people must work in acts and sign contract for season’s work." " . . . A typical medicine show might last two hours and was made up of eight or 10 selections, including two or three lectures and their accompanying pitches. Most began with a banjo solo or two designed to settle the audience or a song and dance number featuring the whole cast. Frequently, the second item on the bill was a rapid-fire exchange of jokes and stock bits between the blackface comedian and the straightman. Next came more music or a specialty number-mind-reading, magic, trick shooting, perhaps a sword swallower or ventriloquist-followed by the first item pitched, often soap, since it was relatively inexpensive and could be used to put a tight-fisted audience in the mood to buy more expensive tonics and laxatives that appeared later. Another act or two followed, usually a comic bit and a musical act or specialty number, and then the second lecture and sale. Finally came another bit or specialty number, the prize candy sake [sale? ], and the traditional medicine show afterpiece, almost invariable a blackface act featuring Jake, the straightman, and a ghost." 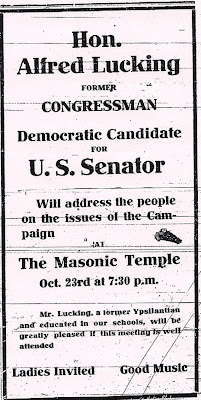 The Ecorse show was likely a free entertainment, attractive to some in that Depression year who couldn't afford to attend a show or movie downtown. That August day long ago, it lured Edward Furlong from his home on Hamilton Street, into thin air. The dyed shoes looked so nice and new. 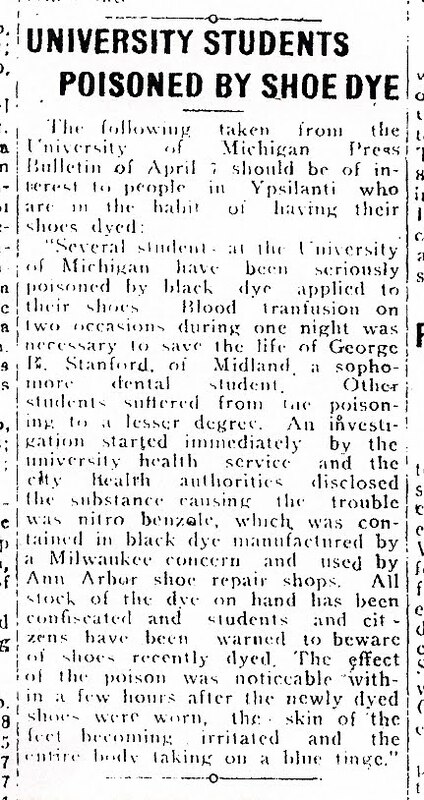 But when several U-M students put them on before heading to class, things turned dark. Or rather, blue. The students looked on in horror as their skin acquired a bluish tinge, one sign of cyanosis. Meanwhile, their feet burned with a red rash. 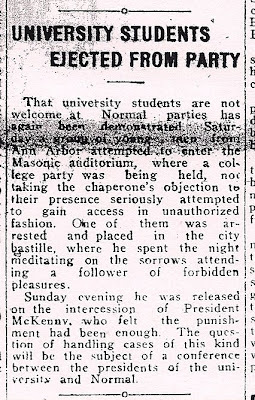 Several students suffered to some degree. Sophomore dental student George Stanford went to the hospital and required a blood transfusion to save his life. The culprit was "nitro benzole," which is highly toxic and easily absorbed by the skin. 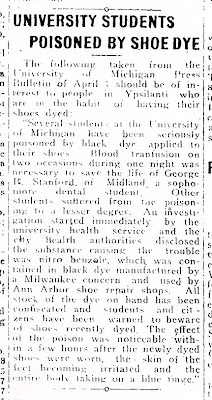 Stocks of the dye were confiscated around Ann Arbor.